Graduated at ELTE-TTK in 1994 as a Microbiologist. Between 2006-2011 he worked for the TEVA Pharmaceuticals at the Active Ingredient Production Department as a development egineer, and performed optimization of fermentation processes, and strain improvement. 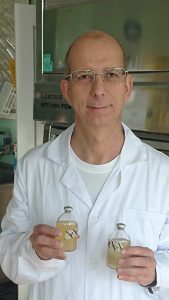 Since 2011 he took part the development of „Ginepp” a nutritional supplement containing Lactobacilli, bearing with strong immunregulatory property. In 2017 he was admitted by Fermentia Ltd and takes part fermentation optimization in different projects and development of probiotics. Szilágyi G, Simon L, Koska P, Telek G, Nagy Z.
Visualization of mitochondrial membrane potential and reactive oxygen species via double staining. Neurosci Lett. 2006 May 22;399(3):206-9. Epub 2006 Mar 10. Péter K, Attila V, Eva KT Adrienn S, Zoltán N, Bertalan F.
Ideggyogy Sz. 2013 May 30;66(5-6):184-9. Koska P, Dojcsák Kiss-Tóth E, Juhász Szalai A, Kovács GL, Barkai L, Rácz O, Fodor B.
Acta Physiol Hung. 2013 Jun;100(2):133-9. doi: 10.1556/APhysiol.100.2013.2.1.